It’ll probably be fairly quiet around Startled Disbelief and the Winnipeg Skeptics blog over the next few weeks, as everyone prepares for Hanukkah, Saturnalia, Newtonmas, Kwanzaa, Festivus, Christmas, etc. Aren’t familiar with some of those holidays? Well, you’re in luck! I happen to have some explanations handy. 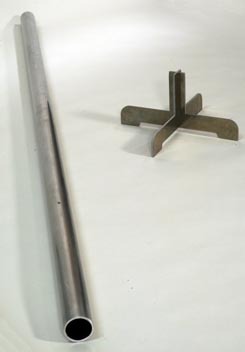 Image from Wagner, where you can buy your own Festivus Pole! Hanukka: a Jewish celebration of, as Jon Stewart put it, “oil that burned quite slowly”. Saturnalia: a Roman celebration of the god Saturn, involving reversal of social roles, feasting, and general merriment; often identified as the festival on which the later Christmas was modelled. Newtonmas: a celebration of the birth of a seventeenth-century alchemist who may or may not have invented the cat flap; celebrated on the same day as Christmas. Kwanzaa: a North American celebration of African heritage and culture. Festivus: a holiday created by writer Dan O’Keefe and popularised by Seinfeld; includes erecting an undecorated aluminum “Festivus pole”, the “Airing of Grievances”, “Feats of Strength”, and the declaration of fairly commonplace events as “Festivus Miracles”. Christmas: a celebration of the virgin birth of the son of the god Yahweh, who also happened to be Yahweh, who was fated to be brutally tortured and killed as the final blood sacrifice to Yahweh to atone for the transgressions of men against rules initially set up by Yahweh, who (being omniscient) must have had foresight that this would be the eventual result of said rules.